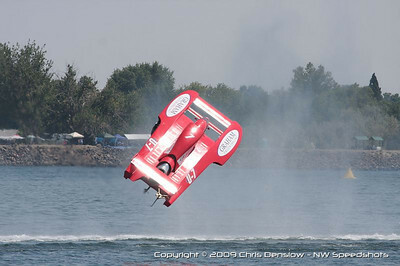 The U-7 Formula Boats flips at 2009 ABRA Columbia Cup on July 26, 2009 in Kennewick, WA. Scott “Pyro” Raney invited me to join the U-37 Schumacher Racing crew for the swing through Washington, doing the onboard video. Had a great time, but was really bummed when J. Michael Kelly flipped the U-7 right in front of me, fortunatelycoming out of it unscathed. Lisa Courneya’s gallery of the Unlimiteds at Tri-Cities. Friday night’s Dash for Cash at the 2007 ABRA Columbia Cup. Joe Turner started the day really well, finishing second in his first heat of the day, but losing the engine cowling in his second heat. 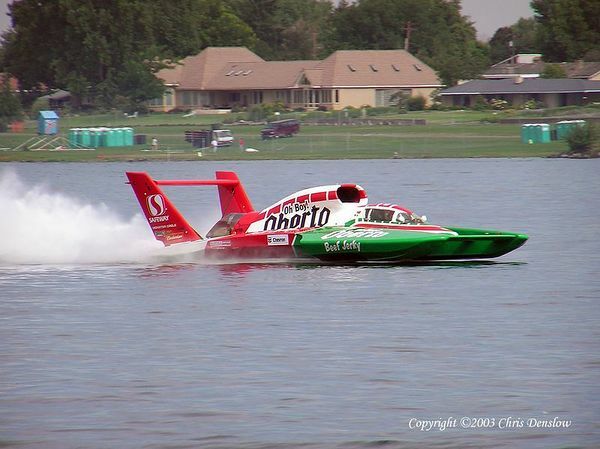 The UL-18 started its last race at the rear, but was running well when, at the entrance to the north turn (150 feet away from me, as I was on a course boat taking photos), the boat hit hard, shredded the right sponson into what seemed like a million pieces of fiberglass, wood and foam, hooked left, then stopped right in front of us. We saw the hatch open a few inches, then the boat immediately took on massive amounts of water and went under within seconds, with Joe inside. We manuevered over to the boat and its huge debris field, waiting for what seemed like two or three minutes for Joe to get out, but he didn’t come up until the divers retrieved him. Joe surfaced and got into the rescue boat, seemingly none the worse for wear! After a quick checkup to make sure he was OK (he mentioned to Lisa that his blood pressure was higher during his physical than it was after the crash! 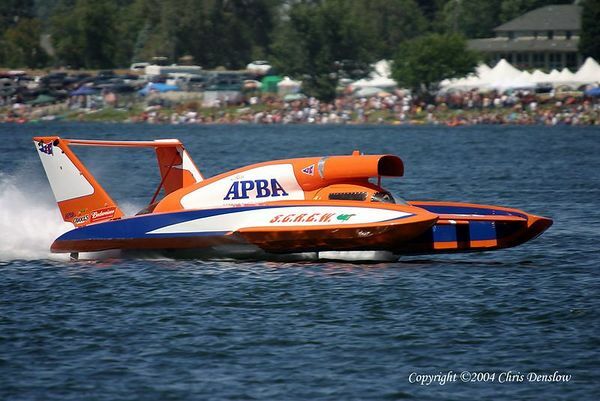 ), Joe made his way to the pits to await the remains of the boat. As the UL-18 came out of the water, it was obvious that the right sponson had broken off, taking the entire right side of the boat with it, almost to the transom. The nose of the capsule was gone, exposing the cockpit, and the force of the river water exiting the motor was enough to blast a four inch long chunk out of one of the header tubes! Joe joked at the awards ceremony that at least now he “won’t have the oldest boat in the fleet at the next race!”. 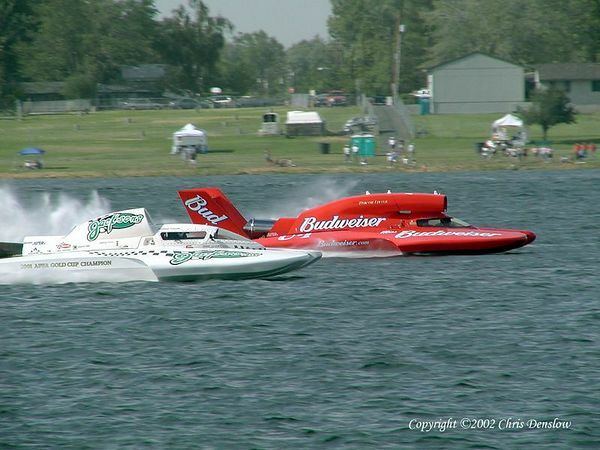 Chris Denslow’s gallery of the 2005 Columbia Cup.